But do you remember it? It was a whole year ago, that my little bag made it appearance into the world in the first copy of SewHip!! At the time I was so excited about the whole thing I could have burst, now, well it seems like a long long time ago, and for I also only got the bag back a few months ago. So what now for the bag? Well to start with from next Monday you will be able to download the pattern as a PDF from here, for free! And, I’m going to be giving away the little bag (with some extra goodies of course) to someone who leaves a comment on this post! I hope it’s a nice giveaway, and I’m sure it will go to a good home, so please leave a comment and you may be the lucky winner! I put up eight of them, please have a look, and who never know, might buy one! Thanks, and good luck on winning the bag!!! « sunny	» a winner, and a runny nose! I wish I could get copies of Sew Hip here, but alas I cannot. But, maybe I’ll win your precious little bag. Love the little pouches, BTW. I’m going to keep an eye out for a couple that compliment my Raspberry tote and knitting bags I have. 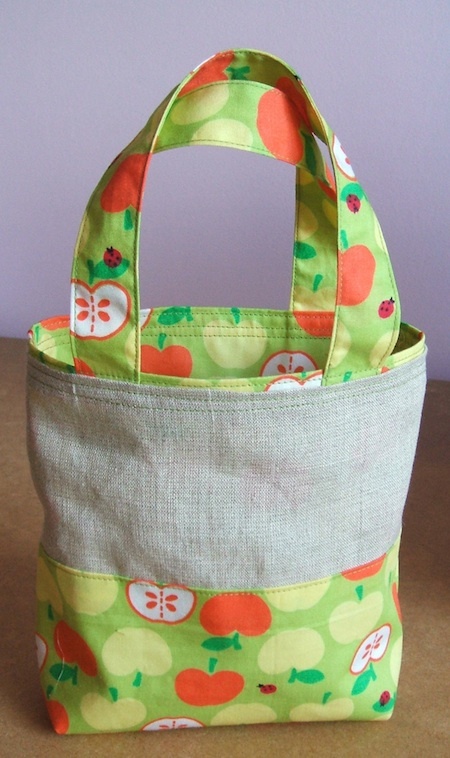 Nice little bag, I like the apples and little ladybugs very much. Hoping to win it! And the little pouches are simply adorable. Love this bag, so colourful and bright. Hi Raspberry! I would love to be entered in to your giveaway – that is such a cute bag. Am enjoying seeing all of your new items in your shop, they are looking great. I remember! Terribly exciting! And to own one myself well that would be close to be that exciting! oooh yes please! love the old bag and the pouches are really sweet too! I adore your work…pick me please. Hehehehe…a lot of hugs from Chile!!! I already have an old bag! Oh I would love to win that happy, sunny bag. I look forward to the PDF to make my own too (though I dont have the sweet apple and linen fabrics). Your new pouches are adorable. Hi! I remember this bag VERY well : i made one of my own than;ks to your pattern in sew hip (if my memory is good, you commented on it…) Of course, i’d love it if you picked me. Ok, i know international shipping is expansive. But i’d be thrilled. ooh, i’d love to enter too, hope i’m not too late. I really enjoy your blog, Thank you. ooh – so lovely! I just adore your pouches. You’ve inspired me to start wet felting! Whoops!! I too would like to enter your give way please. Such a lovely bag! I’d love to win. Gotta go check out those little pouches – too cute! One old bag(me) in need of another (new)old bag(yours)! I love your work. The bag is so beautiful. This is a great giveaway – Count me in! As requested in your email I have added it to my Giveaway HQ! A lady can never have enough bags especially ones made by the very talented Alice, so please count me in!! That bag is utterly adorable and I would care for it and know it would care for me and my bag must haves. The pouches are lovely, I like the green one. Oh, I’m very nearly an old bag (very soon be4 0!) and would love a new bag to show I’m still “sew hip!” I’m really inspired by all your work and love your new photos on the fence a great choice for your nature inspired designs! 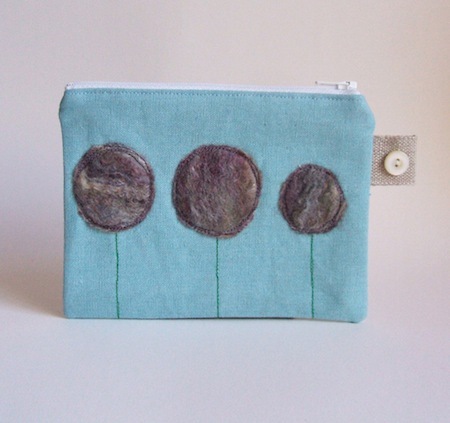 I love this sweet little bag!, I bought a blue linen ‘waves’ bag from you about 2 years ago now , it has had a busy but very happy life so I will be very sad when it finally gives up the ghost!. What a pretty ray of sunshine, with autumn setting in this would help brighten my day! and your right if that wasn’t impressive enough your etsy shop and stock is wonderful. I love your style of applique. As your hampshire based do you attend the rockbourne fair? Cheeky husband comment!! I love this bag, in fact I love all of your bags. Of course I remember that bag, how could we forget? Your work is so inspiring, if only I had your eye for design……….. I think this little poem from Jane Austin befits this bag! I actually started buying SewHip after reading about it on your blog! Could say I’m a fan as checking it out each day to see if there’s any new news is my favourite task avoidance ploy when I’m supposed to be sitting at the computer working!!! I’m the original “old bag”. As an ‘antique’ mountain bike racer, and a feminine one at that, being 54 means being my racing-mates MOTHER’s age. Last race completed: crossing USA (4200 miles, over 59 days…called the 42bike ride) this summer. There were no prizes of course since it was actually not supposed to be a race, even though every day it devolved into one. My reward for being their mom’s age would be sporting a purse that their girlfriend (it was mostly young cute 25 year old men who took part in the 42ride) would kill for. But only if YOU think so, raspberry fairy! oh your giveaway is really lovely. i wish i can win this bag. 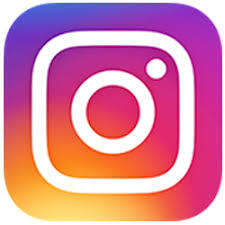 🙂 check out my blog, i too am having a giveaway ! Oh 41 posts! i’m always late!!!!! I’d love to give the old bag a new home! I could never sew one as nice. How cute! I love apples! Fun and fruity! A great way to “bag” my five-a-day!! It must have been exciting see your bag in print like that. I remember it well. I love those new pouches you’re making. You ‘motif’ button look great as a side tab and the applique style you have really looks fantastic on that smaller ‘frame’ size or however you describe it.. Gorgeous. Very much looking forward to the pdf, but it would be great to have the ‘orginal’ to refer to as well! Lovely stuff as always. After reading about your bag on your blog I rushed out to buy Sew Hip so I could have your pattern, but the original is really special. I love reading your blog and seeing all your designs, you are so talented, thank you for sharing it with us. I have that copy of sew hip! it will be so nice to have that bag. Thank you very much for the idea and for the giveaway. Super blog and beautiful bags! Long may they both continue! What a fresh little beauty. Please add me in. I love your bags and catching up on your blog. I think it would be perfect to add colour to any grey day. What an adorable bag … I know my daughter would be fighting me over it 🙂 Please add my name into the draw. Your blog is an inspiration indeed! If a new bag came into this household because I had been lucky enough to win it, hubby couldn’t complain could he??? Love the blog. Love the bag. Love to win the giveaway. Oh I just love this bag! And I’m sure I could give it a good home! Keeping my fingers and everything else crossed! If I don’t win the giveaway I will definitely have to download the pattern and have a go at making my own. It’s time I gave my sewing machine a good dusting down and put it into action. Love the bag! Thanks for the link to the pattern… my daughter will have me making them for every costume hse has! Absoultely beautiful items, I’d be honored to win one! I LOVE the new items too. Many thanks for this competition. i LOVE that bag :D.
my gosh, has it really been a year already?! I’d love to be in with a chance of winning your loely little bag! Really a very very beatiful bag! !